Lang, Elon, and Robin Wharton. 2014. “Scholarly Editing Through Digital Pedagogy in the Hoccleve Archive.” Paper presented at the 19th Congress of the New Chaucer Society, Reykjavic, Iceland, 18 July 2014. Wharton, Robin, et al. 2014. 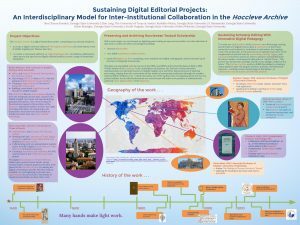 “Sustaining Digital Editorial Projects: An Interdisciplinary Model for Inter-Institutional Collaboration in the Hoccleve Archive.” Poster presented at the 86th Conference of the South Atlantic Modern Language Association, Atlanta, Georgia, US, 7th November 2014. Lang, Elon, and Robin Wharton. 2015. 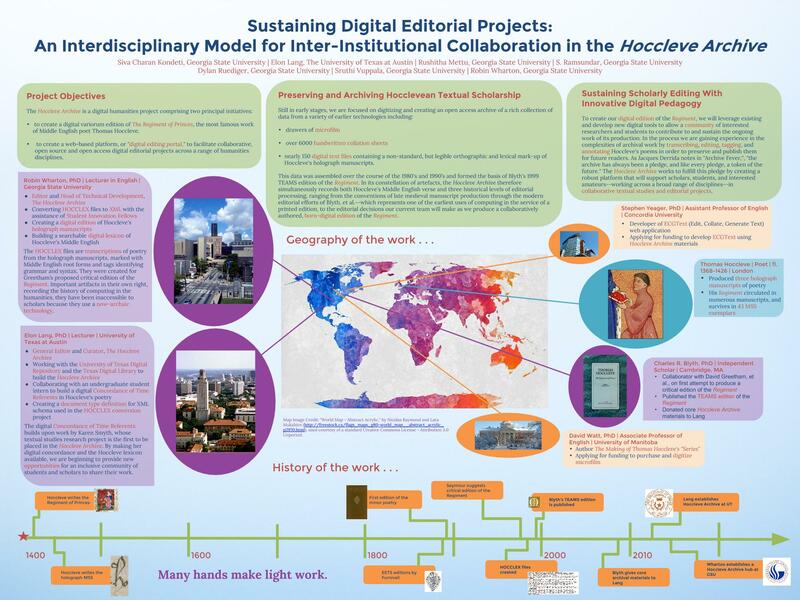 “Creating Overlapping Communities of Practice: Digital Editing, Teaching, and Scholarship in the Hoccleve Archive.” Paper presented at the 50th International Congress on Medieval Studies, Kalamazoo, Michigan, US, 16 May 2015. Lang, Elon, and Robin Wharton. 2015. “Flipping the Edition: Working in Archives and Building Them Digitally With Students.” Paper presented at HASTAC 2015: The Art and Science of Digital Humanities, East Lansing, Michigan, US, 29 May 2015. Lang, Elon and Robin Wharton. 2016. “Transforming Texts and Textual Scholarship in the Hoccleve Archive.” Presentation in DH Projects showcase at the Annual Meeting of the Medieval Academy of America, Boston, Massachusetts. February 2016. Lang, Elon and Robin Wharton. 2016. “Exploring Medieval Multimodality Through a Pedagogy of Making and Remediation.” 20th International Congress of the New Chaucer Society, London, United Kingdom. July 2016. Wharton, Robin, and Elon Lang. 2016. “Archive or Scriptorium? : Digital Scholarship and Textual Studies.” 20th International Congress of the New Chaucer Society, London, United Kingdom. July 2016. Wharton, Robin, and Elon Lang. 2018. “Anti-Establishment Hoccleve and Resistance.” International Hoccleve Society Special Conference: The Making of Thomas Hoccleve, Winnipeg, Canada. 6 July 2018. Lang, Elon, and Robin Wharton. “Digital Tools for the Study of Hoccleve.” International Hoccleve Society Special Conference: The Making of Thomas Hoccleve, Winnipeg, Canada. 6 July 2018.